I haven’t recovered (yet) from this year’s gamescom, but I would rather do the customary media coverage analysis blog post while it is still fresh. If you are so inclined you can read the 2014 and 2015 posts, but I will be comparing previous years to make it easier. The methodology is the same (data is from Sunday to Sunday, across all the media we track). Let’s review the specifics of this year edition. The dates changed again, getting closer to the middle of the month compared to last year’s. This year the dates were more “normal” as far as gamescom is concerned, starting on the 17th and closing on the 21st of August. Last year Sony did not put together a press conference, leaving the field free for Microsoft. This year Sony again skipped the once traditional Press event at gamescom, and Microsoft has followed their example. While I can see the logic behind Sony’s move, after all they have many other events in lieu of the gamescom for their communication if they follow last year’s pattern, Microsoft hasn’t structured its communication that way in the past, and they haven’t announced anything to make up for the lack of a press event in Cologne. Last year Sony used the Paris Games Week as its European press event, but there hasn’t been any announcement so far in that regard for 2016. They do have a new event called the PlayStation Meeting in early September, which I will keep an eye on for sure. The space was the same surface area as last year. gamescom has reached an interesting size issue, where they can’t welcome more people. The tickets are sold out and there isn’t much more space in the Messe to expand too. There is also the issue that even if they want to have more space, there might not be much interest from exhibitors to expand further than what they currently have, and the companies not exhibiting probably have good reasons not to. I will talk about it at the end of the post, there are some changes coming that might help. So. What about the media coverage? So, I should preface this year’s analysis by a disclaimer that I don’t pretend to understand all the forces at a play where those numbers are concerned. Most of what you will find are educated guesses and I try to corroborate the theories with the data, but it doesn’t always work. 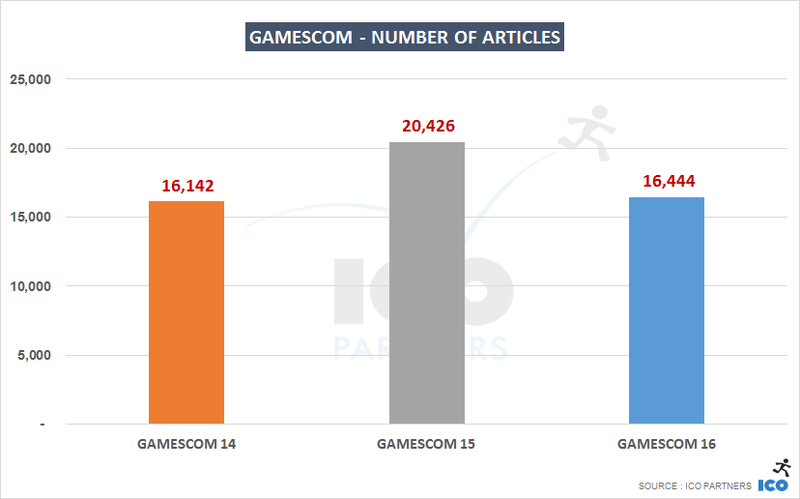 Here, we see a decline in the total coverage of the gamescom’s brand from last year. But while there was a significant drop, which was expected with the lack of major press conferences, it stayed at the same level as 2014, where there were two press conferences. So I would say that gamescom has reached a point where its relevance to the media (and the publishers and studios planning their communication strategy) has gone beyond the consoles’ press events, and it stands on its own. As expected, a lot of the articles are coming from German media (this is where I plug our report on the media landscapes – you can download it for free and it can give you a sense of the size of the media in the different languages). Nothing surprising yet there. 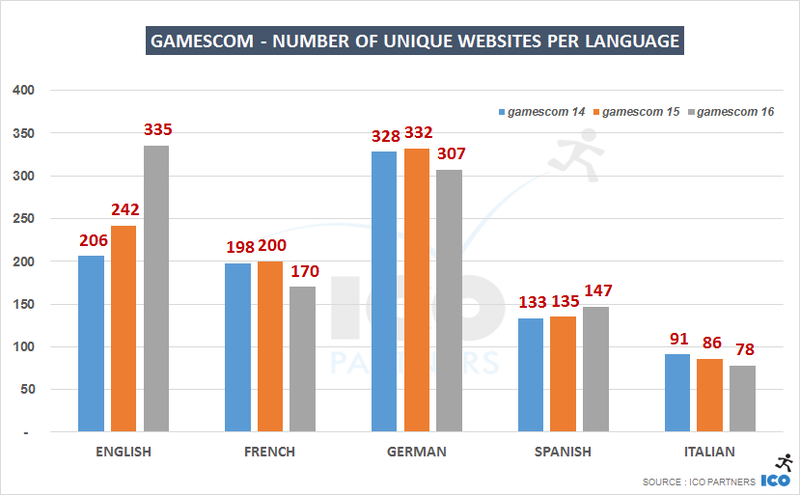 Looking at the number of unique websites mentioning gamescom, we find a different result though… There were more English websites than German websites covering the event (keep in mind that most of our database is very much games websites, there are plenty of General Interest media that we don’t track properly). 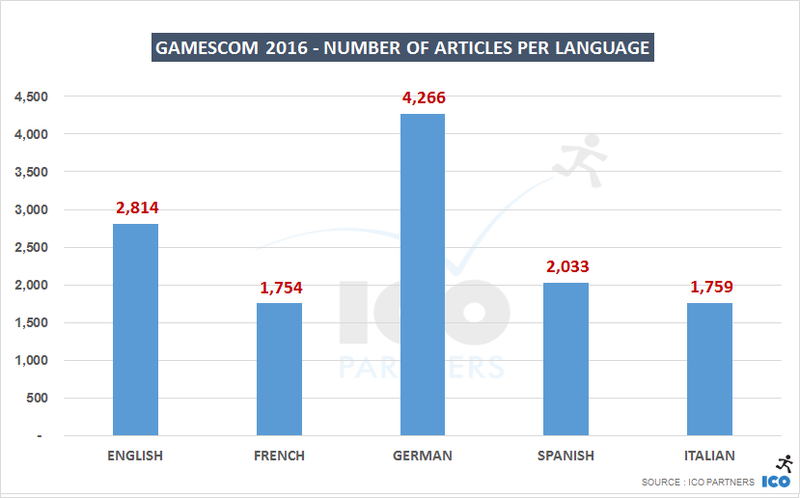 So, looking at the past 3 years, we can see that in every language, there were more articles last year than in the 2016 edition. It all makes sense. The year-on-year drop can be more or less drastic depending on the language. In French and German, it goes below the 2014 level for instance. 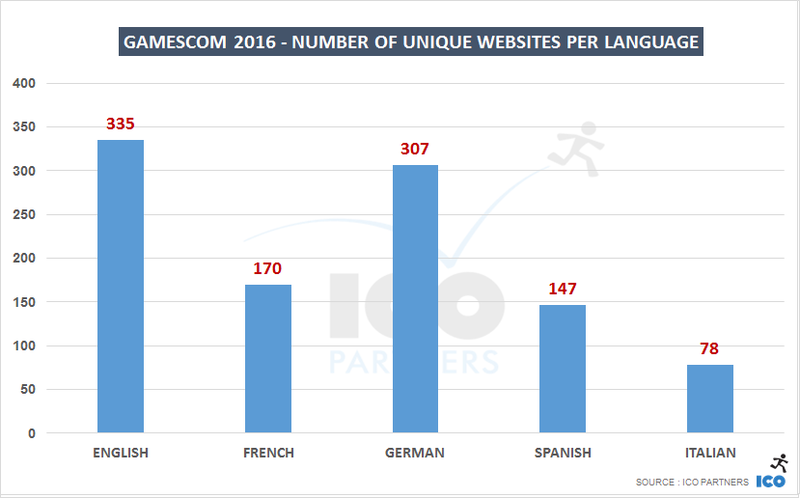 But looking at the number of unique websites covering gamescom in English, there is a significant growth over the past 3 years, to the point that they are actually more websites in English covering gamescom, than German ones (again, in our sample). 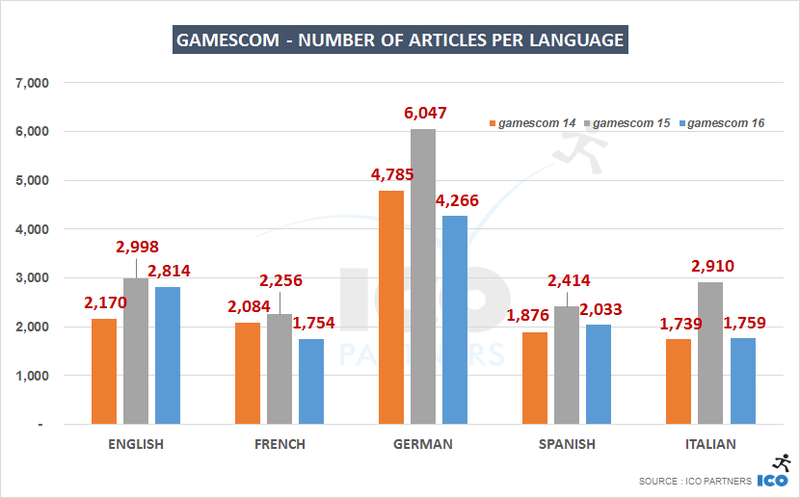 English media were probably a bit behind the other ones in taking into account gamescom as a major industry event. It seems that this year, they have caught up, and they have increased their coverage of the event considerably. That’s impressive considering that it happened without the support of any major press conference. 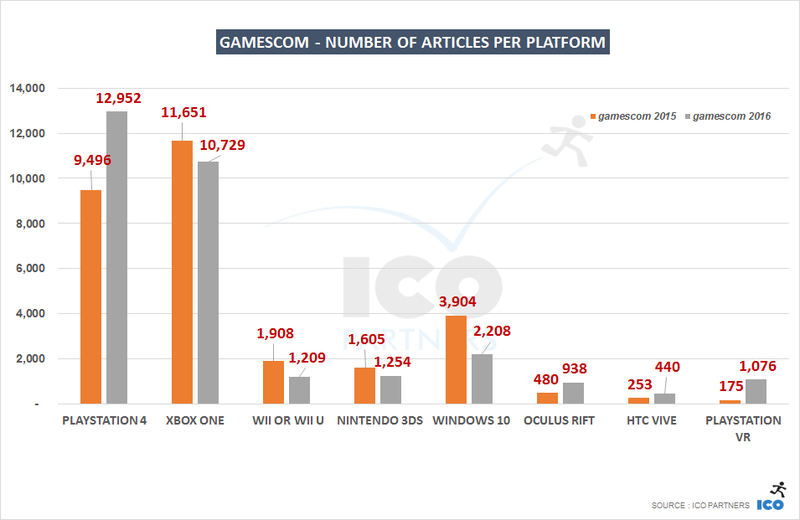 Looking at the articles mentioning the platforms during the week of gamescom, the slight drop in articles on the Xbox One was to be expected with no press conference this year. The VR platforms all saw more coverage, with the PlayStation VR taking the spotlight this year. PlayStation VR. We know that PSVR had a very significant effect, but in the best case, it can only account to half of the extra coverage. Lack of Press Conferences. The absence of an Xbox press event meant that the attention bounced back to PlayStation from last year coverage. This is a good theory, especially when you consider the dominant position of PlayStation, even if the drop of the Xbox coverage, all things considered, is not that significant. Natural growth of gamescom coverage. 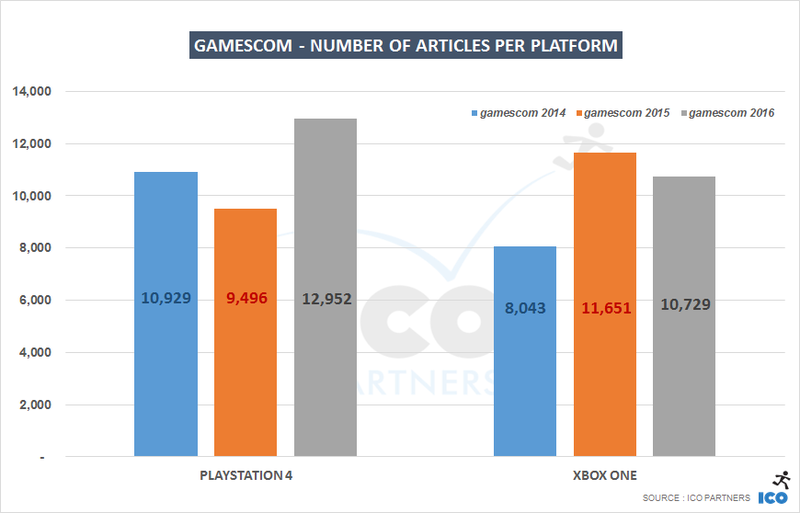 We saw the significant bump in the English media covering gamescom, there might be a side effect here where that benefited PlayStation in some ways. As we are looking at two different data sets, there might be a growth of the PlayStation coverage from the additional visibility that doesn’t necessarily mention gamescom. Specific games. There are few games that seem to emerge supporting this theory. There is a little bit of extra coverage thanks to No Man’s Sky, and there is also some coverage specifically discussing Titanfall 2 coming to PlayStation 4 after the exclusivity of the first iteration on Xbox One. But in both cases, this seems very limited in volume. PlayStation 4 Slim edition. The rumours only started to show up online in a significant way on the last day of gamescom, a Sunday, and the volume is quite low. PlayStation Now coming to PC. The announcements (and its coverage) only started the following week. If you have another theory, please let me know on Twitter, I am quite keen to hear your ideas as I might have missed something obvious here. For the moment, I think this is a combination of those factors that took PlayStation to its excellent media coverage this year. This year’s E3 saw very strong media coverage across the different platforms. In the case of the PlayStation 4, the growth in the media coverage at gamescom (+36% from last year) is triple the one it had at E3 (+12% from last year). For the Xbox One, we see a slight drop at gamescom (-8% from last year) against a significant growth at E3 (+21% from last year). It has to be noted that Microsoft presence at this year’s gamescom was quite timid. Its booth was significantly smaller than the previous year from what I could tell (couldn’t find a proper floor plan of the consumer halls), especially compared to Sony’s (it was probably 6 to 8 times bigger). 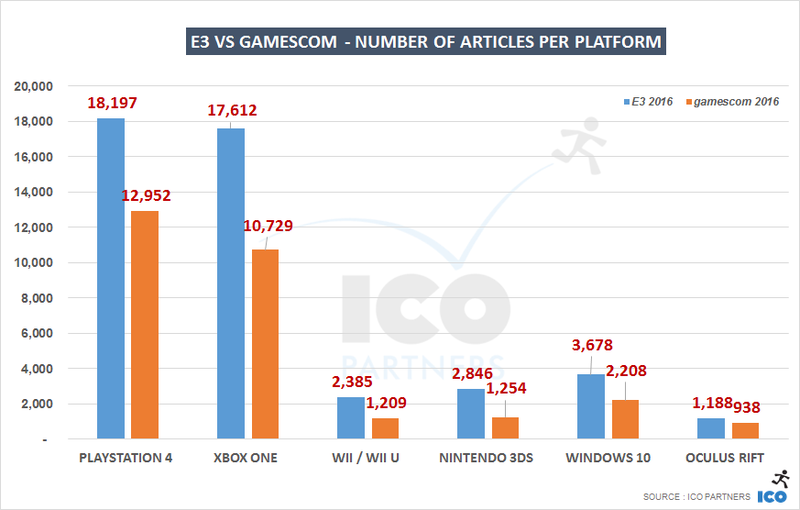 It seems to me that Microsoft backed out of gamescom more strongly than Sony, and the discrepancy in the media coverage is showing it. On the other platforms, I want to specifically mention the Oculus Rift. Year-on-Year, its E3 media coverage increased +18% against a +95% increase for its gamescom coverage. In both cases, the device is now available compared to the previous year, but Oculus seems to have managed to come across to the media at gamescom much more efficiently than the previous year, with media coverage at the same level as its E3 coverage. Again, I picked the top 30 games in terms of coverage during the week of gamescom. Pokemon Go and No Man’s Sky both are here despite having no specific announcement at gamescom. They just happen to be the hype-of-the-month, and it is as such a scale that they both take the top spots. Final Fantasy 15 is the third most mentioned game, but only partly because of its gamescom presence. The announcement of the delay early in the week is a significant part of the coverage of the game (and by far the biggest beat the game received). Call of Duty PR machine is losing hard to its Battlefield nemesis this year. Also, very interesting to see that Titanfall 2 is also doing very well media wise. Little Nightmares was incredibly well covered for a game of that profile. I find the results of this year’s analysis are fascinating. I was going into it expecting to see some decline due to the lack of the big press events to support the media attention. 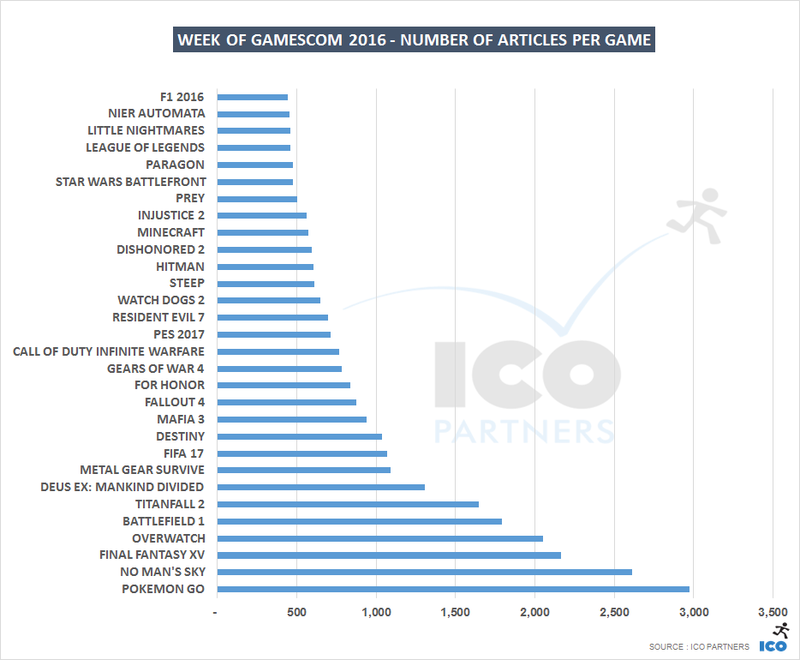 And while there has been a decline in the total coverage mentioning gamescom, it was not drastic, and as far as the media attention on key game platforms, it certainly was a good week. It seems that the event has grown to the point of developing an autonomy from the big press-only conferences, and has enough interest on site to stay relevant without them. Of course, all the key industry actors were there, and still supporting it, but until we see an exodus of such companies, gamescom seems to be now well and strongly positioned to be the most relevant game event in Europe when it comes to media, and is probably only second to E3 in the world. Take notes for next year, and remember that the dates have changed again. It will at the same time of the year, but happening from Tuesday to Saturday instead of the traditional Wednesday to Sunday it has been at for years.